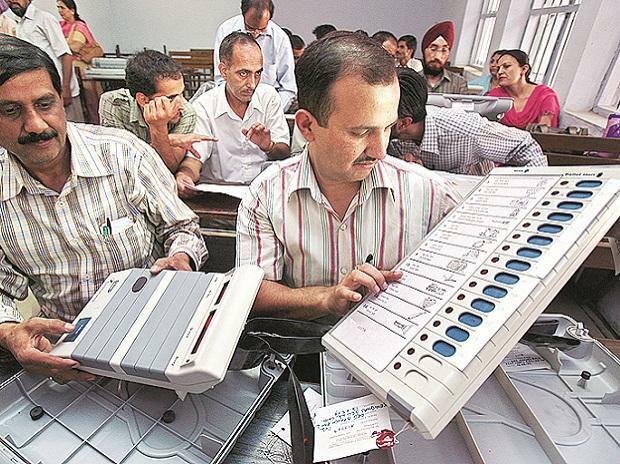 The Election Commission on Sunday directed the Chief Electoral Officer of Telangana to make arrangements for conduct of elections in Nizamabad constituency, where 185 candidates including over 170 farmers are in the fray, using EVMs instead of ballot papers. After the deadline for withdrawal of nominations ended Thursday, a total of 443 candidates remained in fray in Telangana, with Nizamabad topping the list at 185. With the number of candidates higher than what the EVMs can accommodate, Telangana CEO Rajat Kumar had earlier said the polls will be conducted through ballot paper and the matter will be referred to the EC for approval. According to an official release, the Commission has issued orders to M/s ECIL for immediate supply of 26820 BUs, 2240 CUs and 2600 VVPATs of third-generation (M3) Electronic Voting Machines make, to CEO Telangana. The farmers had filed their nominations from Nizamabad, where Chief Minister K Chandrasekhar Rao's daughter K Kavitha is seeking re-election, protesting the alleged failure of the ruling Telangana Rashtra Samithi to ensure minimum support price for turmeric and red jowar (sorghum). They are also demanding setting up of a turmeric board. Telangana, which has 17 Lok Sabha constituencies, goes to polls in the first phase on April 11.